By Neely Simpson. Sep 3, 2015. 9:00 AM. Alison Lurie has written on a wide range of topics; everything from architecture, to children's literature, to fashion. She is best known for her socially satirical novels, which are often compared to those of Jane Austen. 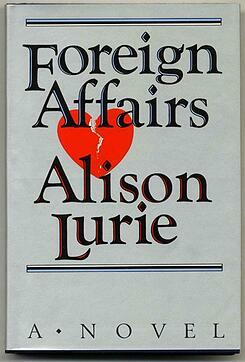 Her novel Foreign Affairs, won the 1985 Pulitzer Prize for fiction. Despite her acclaim as a writer of fiction she says, "I don't know that many stories that I want to tell. So in between the stories I just talk." She said in a 2014 interview with National Geographic, "Throughout my whole adult life I've written fiction and nonfiction. And when I can't think of a good idea for a novel, I'll write about something else that I'm interested in. And I've got lots of interests." Alison Lurie is the Frederic J. Whiton Professor of American Literature at Cornell University where she teaches literature, folklore, humor, and writing. Academia is in her blood. Her mother was Bernice Stewart, a journalist for the Detroit Free Press. Her father, Harry Lurie, was a Latvian-born sociologist who spent his career working for various Jewish social service organizations (even though he was an atheist), and taught at the University of Michigan, the University of Chicago, the University of California, and Columbia University. Lurie was born in Chicago in 1926, deaf in one ear from a high-forceps delivery. When she was four, her family moved to New York State where she grew up. After graduating in 1946 from Radcliffe College, Lurie became an editorial assistant at Oxford University Press in New York. In 1948, she married Jonathan Bishop, further widening her sphere of academic relatives by gaining poet and author John Peale Bishop as a father-in-law. However, after having three children together, the marriage ended when Bishop converted to Roman Catholicism and considered entering the priesthood. In 1995, she married fellow novelist and Cornell professor Edward Hower. "I wrote it because I was afraid I would forget all that stuff and I wanted some sort of record. Some friends got 200 copies printed in Europe and we sent them out. Someone then sent a copy to an editor in New York, who wrote to me asking if I had a novel. But if the photocopy hadn't been invented, who knows, I might never have been published." It was 1959 when her memoir of Bunny Lang was privately published. Her first novel Love and Friendship was published in 1962. In addition to the Pulitzer Prize for fiction, Lurie has also received Guggenheim and Rockefeller Foundation grants, the American Academy of Arts and Letters Award in Fiction, and a D.Litt from Oxford University. In her private life, she is a grandmother to three grandchildren, and her personal website says she enjoys gardening, needlepoint, and the collecting of contemporary folklore and ghost stories.